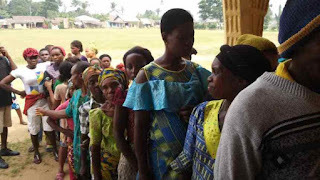 Nigerian electorates queuing up to exercise their civic duty. Nigeria general elections of 2019 will go down in history as one with the most aggressive campaign in terms of advocacy against voting buying or selling real time. From Lagos to Abuja to Kaduna to Kano and indeed every nooks and crannies of the country, independent advocates in turns have mounted the air waves with no hold barred discussions, songs and dramatic releases targeted at taming the monster called vote buying or selling if you like. Celebrities across industries were not left out. They took out time to carefully outline the many dangers the practises portend which include mathematical breakdown of reward per second, minute, hour, day, week and month to the bought electorates and the democratic culture in the long term. They also aim swipes at elements on both sides of the mutual divide because where there’re no sellers; there won’t be buyers vice versa. On the surface of it, the messages of these multitudes of electoral advocacy groups appear well received by all and sundry; and could serve as sufficient deterrent to a significant number of intending dealers if not all. But it was as if all the efforts fell on deaf ears at the end of the day if event surrounding the elections so far are anything to go by. With the first round of elections concluded well over two weeks ago with regards to the presidential election. Talks were rife concerning incidents of vote buying even at the polling stations in contravention of relevant electoral laws banning such and prescribing punishment ranging from imprisonment to fine. Videos evidence have also emerged of agents of various political parties holding wads of Naira notes with the sole aim of inducing and indeed paying voter who is willing to play ball. There were also videos of persons thumb printing away at the ballot papers to be stuffed into the ballot boxes while electoral officers and security personnel looked away. Doubts still exist if anybody has been arrested in connection to this alleged electoral malfeasance from the presidential election held on the 23rd of February 2019. On the 9th of March, 2019, the last round of elections went down in different parts of the country to determine who becomes governors, ward councilors, local government areas Chairmen (in FCT especially) and members of states legislative assemblies. And guess what, a vote goes for the price of Maggi! And it’s so, perhaps because women (mothers to be precise) were at the forefront of the door-to-door purveying of the ads messages to this effect. This took place on the day of the election. That's not to say men too are not involved. They were and they should apparently because elections in Nigeria is incomplete without them. They are a major stakeholder. Maybe theirs would not take the peanut nature like women. On the eve of the election, discussions of men seen in small groups would've nothing at the center besides elections matters. And sure money is involved. Trust men; they will speak in thousands and more. Whichever way, what's bad is bad and should not be euphemised to make it sounds appealing to ears. And it’s unlikely somebody would ever be arrested because the instrumentality are just not there in terms of sufficient policing personnel and political willpower of relevant and respective stakeholders who would be the beneficiaries at the end of the exercise or process. Women, according to unconfirmed reports, could be heard motivating their neighbors (women like themselves) who are unwilling to go and vote for whatever reasons to go and do so for party A, B and C for they stand to be paid five hundred naira concluding it would at least help pay for some cubes of Maggi which is a popular brand of condiment in Nigeria. And response was said to be massive..
By and large, the occurrence and re-occurrence of this illegality is a clear demonstration of how lowly many of us have become and the length we’re willing to go in trading off our future from the cheap value we attached to our vote and political participation in respect of choosing our leaders. We can blame poverty or ignorance or any of such age long whipping boys for as long as possible; but it’s still a choice many are making consciously. And it would not stop as far there’s a buyer and a seller. Still on the governorship and state assembly election of Saturday 9th, February, 2019, overall there was massive voter apathy which many have blame on the outcome of previous presidential and national assembly election. In spite of this, violence incidents were recorded in several states in the country notably Kogi, Akwa Ibom, Kano and Abuja. There were also unconfirmed reports of ballot box snatching and deaths.